Propagate has been discontinued - thanks for a great run! Propagate is a quad, voltage controlled gate delay with some twists. The four stages are capable of delaying a gate signal of any length. Delay time is adjustable via panel or voltage control. Delay mode is either LO for long delay time or HI for audio rate delays. In HI mode, Propagate can be used as a pulse width modulated VCO. The output length in either mode is completely variable via panel or voltage control from an ultra fast trigger to a gate lasting a number of seconds. Beginning with the first delay stage, every output is normaled to the input of the following delay stage. So a single pulse will propagate through each delay to create multi pulsed events, longer delays and longer gates. 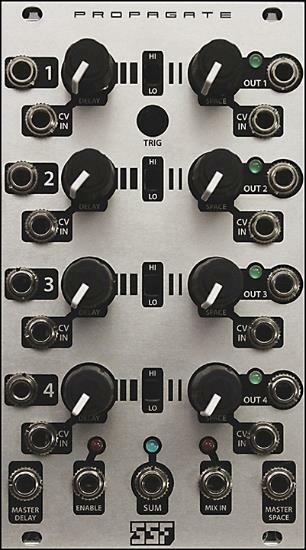 In addition to the individual delay outputs, all are combined internally through a quad logical OR gate to a single SUM output. The MIX IN jack will logically OR any pulse, gate or clock signal with Propagate's SUM. The ENABLE input permits Propagate to be turned ON/OFF via HI/LO gate signals. The MASTER CV inputs for DELAY and SPACE control all four delay stages at the same time, from a single source. Control voltages at these inputs will sum together with any signals present at the individual CV inputs.